"She not only ironed the pants in the family, she wore them too. 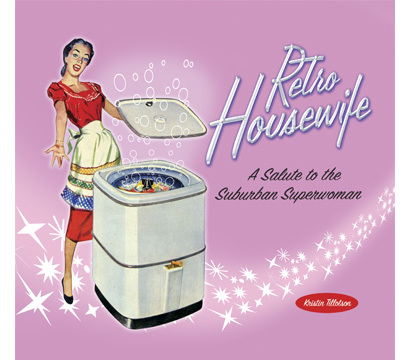 The housewife of the 1940s and 1950s was a lean, mean, household machine. Armed with “amazing” new products and tools guaranteed to make her life easier and more efficient, she smiled her way through the day. A domestic goddess in ruffled apron and coiffed hair, she was the epitome of postwar perfection." I love this book! I swear, I was meant to live then. I adore the entire culture of that era housewife! Now, this is not the only book in the series, and I have several of them. I especially like the cookbooks I own from the retro series. Talk about wonderful comfort food! Go to the retro series page at www.collectorspress.com to see the whole line. Fun fun fun!!! !